We’ve had the dining room set for many years now and the glass tabletop has started to smell bad, kinda like an old fish tank. Over the last few months we’ve tried anti-bacterial wipes, surface cleaner, and vinegar only. We eventually found a solution. I learned that despite conventional wisdom, glass is actually porous. Over the years it had absorbed all manner of scents and smells. We first sprayed a fine layer of vinegar on the tabletop, then liberally sprinkled bicarb of soda all over the surface until there were no exposed glass showing. This was then left for a number of hours (leave overnight if you have the time) for the bicarb and vinegar to do it’s thing. After you cleanup, your tabletop will be left smelling wonderful. What? Are you crazy?? That’s what you’re thinking isn’t it. First off, why I am writing this post. I want to share my unbiased experience switching from Internode to TPG. Let me assure you that this is not a sponsored post! As you no doubt would have recently heard, iiNet have bought Internode. I’ve been a loyal customer of the Node for over 6 years, but living out of the city areas means i’m on a Telstra DSLAM on one of Internodes Easy Reach plans. Due to the “Telstra price squeeze” (in which their retail division undercuts their wholesale pricing by a significent margin) i’m paying much more for less data than if I was on an Internode DSLAM. Which prompted me to look for something with better value. Don’t get me wrong, I was perfectly happy with Internode all that time and had no complaints at all, but I wanted better value, and more data allowance! The only other ISP with a DSLAM in my area was TPG. Now I know TPG have a bad reputation especially in the area of disconnects, slow speeds and most of all customer support. I hit the Whirlpool forums and it seemed that a vast majority of these were customer premise problems, not directly TPG related. I rarely call customer support so that part didn’t phase me too much. After a month of deliberation, I decided to take the plunge and opted for their Unlimited ADSL2+ with Home Phone bundle. Naked DSL would have been a more attractive offer but strangely enough it was $10 more than the bundle. I opted to sign up online. Due to the fact that i’m signing up for their Home Phone bundle, I wasn’t able to churn to TPG and was required to pay the initial signup fee of $99 + $20 deposit for Home Phone. After signing up online, I played the waiting game. The quoted ETA was 10 – 15 days, with the phone line connected within 5 days later. 11 days later, my ADSL was connected. The phone line was connected 5 days later. I don’t use the home phone all that much so I didn’t perform any more exhaustive tests than making sure I could receive calls, and dial out. Synch speeds remain the same as what I got with Internode, roughly 16-17 Mb/s down and 1 Mb/s up. I ran speed tests and packet loss tests overnight and through the day, especially through peak periods and got on average a 0.1% packet loss over 5000 pings. Downloads regularly peak at 1.6 MB/s (note the differing notation between Mb/s and MB/s). Pings to the closest gateway come back at around 19 ms.
Browsing pages seems just as fast as with Internode. Youtube videos also stream just as well. I have an Astraweb account and Usenet downloads peak at 1.6 MB/s at around 10 connections. One thing I did notice is that TPG really provide a barebones service (hence the pricing). The mailbox they provide you is a POP3 mailbox (I was used to being able to hook up my iPhone and Mac simultaneously through Internode’s IMAP facility). No mail forwarding service is provided either. There is also no online ADSL line profile changer, you’ll have to call tech support and get them to do it for you. At the end of the day, i’m very satisfied with the service TPG have been providing and would recommend them. This is MY experience with TPG and may or may not reflect what other TPG customers are seeing. Having unlimited data is a godsend, which enables me to rent movies through iTunes now without worrying about how it’s going to impact my monthly quota. The FXD Pegasus Manipulator 4 is one of the more popular 4 channel 2.4 GHZ co-axial RC helicopters in it’s class. Released in 2011, what makes it so popular is it’s performance in this price range. Its available in shops for around $130 AUD or around half the price on eBay. As there is a lack of troubleshooting guides available on the net for this new model, I thought i’d compile a list for anyone trying to fix their helicopter. Helicopter charges from either controller or standard powered USB socket. I’m no RC helicopter flight expert by any stretch of the imagination, these tips are what i’ve learned flying this model so far. The terminology i’m using may also be incorrect so please go easy on me! Most of this tips i’m sure apply to all models of RC helicopters as well. 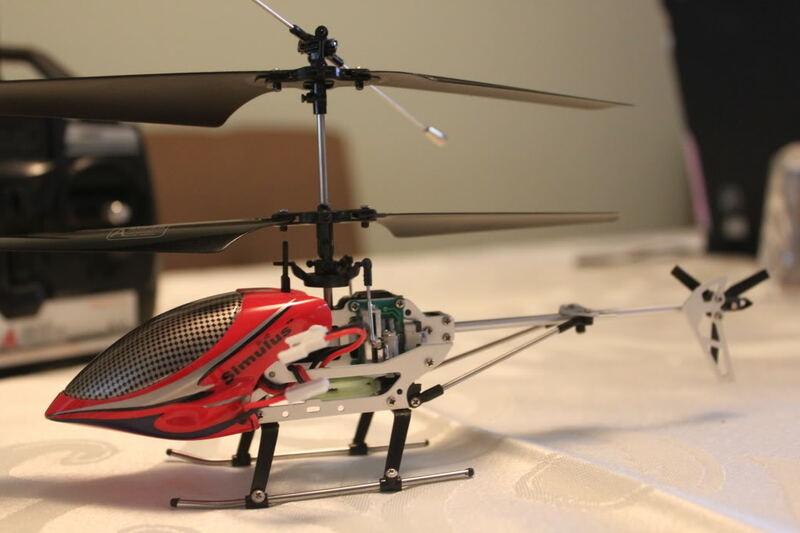 When I first started flying this RC helicopter, I used to tune the trim each and every time before flight. What I found was that that as the helicopter started to “warm up”, it’s flight characteristics would change and the trim would need recalibration again. This started to get tedious so I got used to flying the helicopter with the trim centred and haven’t looked back. I now spend less time fiddling with the trim and enjoy more flight time since precious battery isn’t being wasted during calibration. Landing the helicopter is not as simple as reducing the collective and it settling down by itself. Ground effect comes into play cushioning descent when it’s close to the ground, this causes the helicopter to “bounce” as it nears the ground and then drift sideways which can screw with your carefully placed vertical landing. The best way i’ve found to overcome this is to first get a feel for how much power you need to apply vs the distance you start to float off the ground. Then when you land, make the helicopter descent, and as soon as it starts to experience ground effect, reduce the throttle to zero slowly and the helicopter should land gently (not drop!). I’m sure some people find dropping the helicopter fine but i’m a perfectionist and want to perform a great landing. As this model is fairly new, there isn’t an easy way to obtain spare parts. As it stands I don’t know of any place that sells parts for this model. This section should grow over time. If anyone has any tips they’d like to see added here for the benefit of all, let me know and i’ll add it. Part numbers and names of parts can be found in the manual that came with the helicopter. When spinning up the blades, the whole assembly vibrates excessively and a grating noise can be heard. I haven’t quite been able to figure this one out yet, but I think it might have something to do with where the cyclic control motors connect to the lower blade. Try fiddling with the attachment ring (swashplate?) and see if that helps. The main rotor shaft feels loose and I can jiggle it up and down, causing the rotor assembly to lift up during flight and affect the way the heli performs. This can happen after you crash your heli a few times. The shaft and blades should feel snug, you should not be able to lift the blades and the whole rotor assembly up and down. The cause of this problem is Gear B (part 32) has slipped too low on the gear outer shaft (part 29). If this happens, lift up Gear B higher so there is no play between Gear B and the top of it. Careful not to push it up too much otherwise the lower blade will not rotate smoothly. Once a month, the kids get together with friends in a play group and this month was our turn to host. The pavers out back were covered in moss and needed to be removed quickly and easily. So it was off to Bunnings to have a look at what was available. 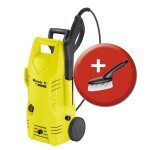 The name Karcher has always been synonymous with high pressure cleaners so I must admit I was biased from the start. They had both Bosch and Karcher ranges there but the Karchers seemed to be better value for money and had a wider variety of nozzles and attachments. So I settled on the Winner 11 which was also their cheapest at $108. After getting the unit home (which I must admit I did in a hurry because I was quite excited to play with it), I unpacked it, hooked it up to the rainwater tank and power and started on the pavers. It took a few attempts before getting the distance right between the pavers and the sprayer (they call it a lance, go figure). The moss came off quite easily and I have to say I was quite impressed at how it performed. What impressed me more was when I turned the lance on our dirt covered wall. It stripped away the dirt like a hot knife through butter leaving clean brick underneath. It did not destroy the brickwork either. Next was the pebblecrete test. After a whole week of waiting (I can’t believe I was looking forward to the weekend so I could clean! ), I tried it on the dirty pebblecrete at the front of the house. It effectively stripped away the baked on dirt once again to revealed clean ground underneath I never knew existed. So in the end i’m very impressed with the unit. It’s pretty efficient with water and has the Smart Approved WaterMark whatever that means. It’s light, pretty portable, and does a fantastic job lifting dirt from otherwise impossible jobs. Mozzies are a pain when out camping, more so when they make it into your tent and you’re trying to swat them. They’re fast little buggers. While camping at Batemans Bay, here’s something I discovered quite by accident while trying to kill mozzies which made it into our tent. If you shine a torch on it and move slowly closer to it, you’ll be able to cover the mozzie with the torch without it flying off. Then all you’ll need to do is slide a piece of paper under the torch and you’ve just trapped yourself a mozzie! I tried this multiple times and it worked wonderfully. The torch I used was quite bright at 270 lumens so that might have helped blind it or whatever. In any case, it beats spraying chemicals around the place, especially when you have youngens around.